Before Ganon's reign, this village was populated by a law-abiding citizenry. There was little crime and the villagers looked out for one another. When the Golden Land became the Dark World, though, they were transformed into despicable shadows of their former selves. 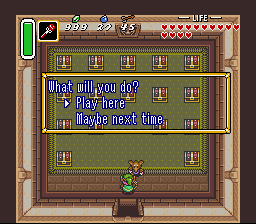 Visitors to the Village of Outcasts are given many opportunities to part with their Rupees. Not only are robbers picking the pockets of travelers on the village paths, but more legitimate means of thievery are being practiced as well. Three nearby establishments are dedicated to assorted forms of gambling. 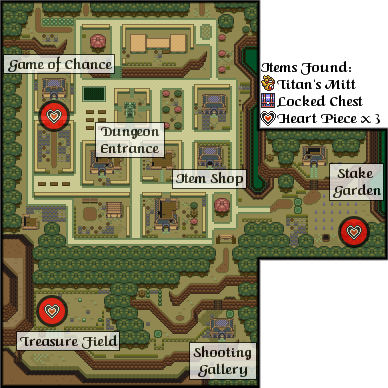 For a price of 30 Rupees, people who play the Game of Chance in the northwestern part of town are allowed to open two of the 16 treasure chests inside and take the contents. Prizes ranged from a single Arrow to a Piece of Heart or 300 Rupees. Visitors can clean up on a good day or lose their shirts if their luck is running low. Shields, Red Potions, and Bombs are again available for the same prices as in other shops in the Dark World. While Bombs can be found under rocks and bushes, the other items can only be purchased. The Stake Garden is located just south of the Blacksmith's burned-out shop. Explorers who possess the Titan's Mitt can lift a huge rock that blocked the garden and gain access to the grounds. Then, by pounding the stakes into the ground, they can cause an underground passage to appear. The first adventurer who finds this passage will collect a Piece of Heart. You'll need the Titan's Mitt before you can access this area. The ghostly proprietor of the Shooting Gallery offers visitors five shots at moving targets for 20 Rupees. If these visitors are sharpshooters, they could earn their Rupees and double with each consecutive hit. If all five shots are good, the shooter will take in total winnings of 124 Rupees. 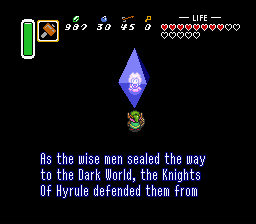 Explorers in the Dark World note that it is full of treasure and hidden items. 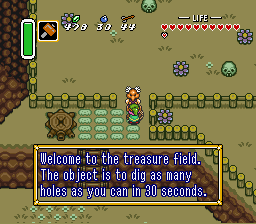 An ambitious landowner in the southwest section of the Village of Outcasts took advantage of that fact by fencing off his land and charging treasure hunters 80 Rupees to dig up the dirt for 30 seconds. If they found anything, they could keep it! A Piece of Heart, the real prize, is hidden well, and moves often. 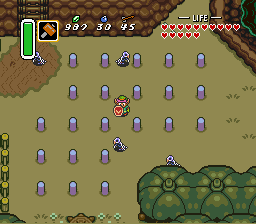 While it's quite possible for adventurers to find enough Rupees to earn their money back, it usually takes several attempts to find the buried Piece of Heart that is hidden somewhere in that large yard. The dark dungeon home of Blind the Thief is under the Village of Outcasts. Blind is afraid of bright light and he never leaves the confines of the dungeon, letting his band of thieves do his dirty work. This three-floor hideout is known as the Gargoyle's Domain because at the entrance to the underground is a Gargoyle monument which looms over the citizens of the village. It takes a strong person to open up the dungeon's entrance by pulling on the gargoyle's trident, and those who do enter can become even stronger by discovering the Titan's Mitt. There are two parts to this floor, the wider front half, and the busier back half. You start off in the wider section, in the room in the lower left corner. This dungeon introduces you to a new monster, the horse-headed Zahzaks. There are blue ones and stronger red ones. They fight much like the guards did in Hyrule Castle only more aggressively. You will very quickly gain all of the essentials for this dungeon, and you can start off by jumping down to the lower level (or climb down the ladder to the left) and head north. You'll have to duel two blue Zahzaks. Turn left at the stone face and you'll find a chest containing the Map. Do an about face and run as far to the right as possible. Then head north to room 1B. There isn't a lot to focus on in this room. 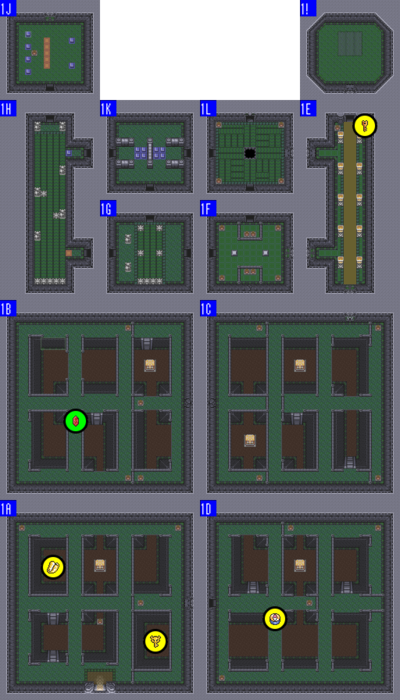 If you follow the walkthrough, then all you need to do is turn right and run into room 1C as soon as possible. 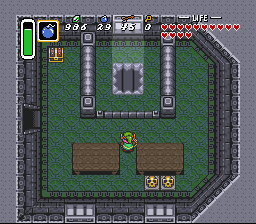 However, if you feel like exploring the room a little bit, you will find a treasure chest which contains a red Rupee, guarded by two Zols. There are also two skulls in the room (along with one in 1A) that contain "Bunny Beams" underneath them, which only appear if you move the skulls, so be careful. The right wall of the upper level between this room and 1C can be bombed open. This room serves as a portal between the lower and upper portions of the dungeon. Like the first two rooms, this room contains "Bunny Beam" traps. Unlike the first two rooms, they are not hidden under skulls. Rather, they are hidden under certain bridges and come to life when you pass through a bridge that hides them. They will chase after you, so try to steer them into a physical object like a stone face. When you first arrive, you'll want to travel south as early as possible to reach room 1D. Once you have collected the Big Key, you will to return here and use it on the door in the upper right corner to enter room 1E. You can also bomb the crack on the left side of the north wall to gain entrance to an otherwise blocked-off portion of room 1F that contains nothing more than blue Rupees. Being careful of the blue Zahzak that you will probably run into when you arrive, climb up the nearest ladder (which should be straight ahead of where you arrived) and walk around the upper level counter-clockwise until you reach the treasure chest that contains the Compass. 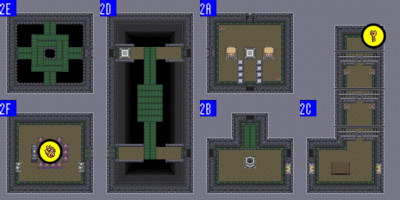 Then jump off the bridge that connects you to the chest and head left through the lower level back to an isolated portion of room 1A where you can collect the Big Key. With the Big Key in hand, you can return to room 1C above. This long, narrow corridor contains three Stalfos: two blue and one red. At the very top before an open door is a skull that hides a Small Key. Collect it, and explore the room above if you wish, but you will find it to be oddly empty. You will return to this room when the time is right. For now, run back down to the locked door on the lower right, and unlock it to enter room 1F. When you have the Titan's Mitt, and you have blown a hole through the floor in the room above, you can enter the top door to fight the boss of the dungeon. In this small cramped room, you will have to face one red and one blue Zahzak, all the while avoiding the fire chain Winder that roams the room. Some of the skulls in the corners have bombs. Head through this room to the door on the left. In addition to the spike traps and the conveyor belt, you must concern yourself with a Bubble and a new enemy known as a Gibo. Gibos have a solid red center that floats inside of a translucent outer shell. The center is vulnerable to your attacks when it flies around the room outside of its shell. There are two in this room. Deal with them or avoid them (and sprinkle some Magic Powder on the Bubble if you're in need of a fairy) and head through the left door to room 1H. This room is a larger version of the room you were just in. 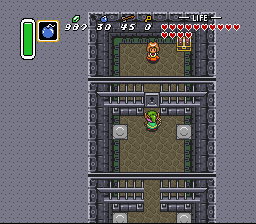 An elongated conveyor belt with spike traps, Gibos, a Bubble, and a fire chain Winder all make for a difficult experience reaching the door at the top. You may also notice the a door to the right that is blocked by a blue fence block. For now, pass through the top door to room 1J. When you return to this room, the blue blocks should be down, so the door to room 1K should be accessible to you. When you enter this room, you will notice six spike traps trapped behind six blue fence blocks. One flick of the crystal switch will change that. The door above is locked, but the skull in the room, guarded by a single Zol contains a Small Key. Collect it, and then flick the switch. Prepare to dodge the spike traps as you run to the door above. Unlock the door and climb up to the first floor. When you return, make sure that the blue blocks are down before you leave and return to room 1H. With the blue fence blocks down, passage through this room should be available to you. There are two red Zahzaks and a Gido waiting for you. Deal with them and enter the door on the right to room 1L. The conveyor belts, spike traps, and Zahzaks are all there to distract you from your ultimate goal. First you must head down the stairwell to the second level basement. When you have completed your objective down there (rescuing a little girl and collecting the Titan's Mitt), you will return here and lift the upper right skull to reveal a switch which will open the right door. Step on the switch, return to room 1E. Prepare yourself for a boss fight and bring the girl along with you to the room above. Walk her into the shaft of light that you created by bombing the floor above, and the boss fight will begin. Hopefully when you arrive here, you have set the blue blocks down, and the orange blocks up. Unfortunately, that means you can't use the telepathy block or collect bombs from underneath the skulls nearby, but you will have access to the switch that's hidden under the lower right skull. Step on the switch to open the right door. If you happen to pull the switch on the wall, you will be bombarded by six Skull Ropers. Run through the open door, and cross the corridor, which contains green cricket-like enemies known as Bazz. After the screen scrolls, continue right and enter the next door. In here, you will find some more Bazz, and more interestingly, a shaft of light that's entering through the window over a blocked-off portion of the floor. The treasure chest in the room contains bombs, and oddly enough, that's just what you need here. When you drop a bomb, you have a chance to pick it up and toss it in some direction. The barrier between you and light is low enough for you to throw a bomb over it, and over to where the light reaches the floor. When the bomb explodes, a hole in the floor will be created, allowing the light to flow into the floor below. Once you've accomplished this, you're ready to return to room 1J of the dungeon below. When you enter this room, there are two Zahzaks to deal with and a Stalfos. Take care of them, and when you're done, the door to room 2D will open. You won't be able to lift the large block in the room right away, but you should be able to when you return here. There's simply one Red Zahzak to deal with. On your first time through, enter the right door to room 2C. After you've collected a Small Key, enter the left door to room 2D. In this room, perilously positioned conveyor belts rotate over a bottomless chasm. You need to maintain your position on the ground. You can cross over to the bottom and head through the right door to room 2B. When you return, use your key to unlock the door that leads to room 2F. Once you're back, You may be tempted to use your newfound power to lift the block and enter room 2E, but there is very little reason to do so. Instead, just head back to room 2A and bring the girl along with you to the floor above. This room is more of a dangerous trap than anything else. Three blue Baris are floating around while two Bumpers rotate around the conveyor belt. Once you enter the room, you must defeat the Baris (most easily done with the Hookshot), in order to open the door and return to room 2D. Once you enter this room, a circle of tiles will begin to fall away from the floor, so you must react quickly. You must pound down the bobbing pegs with your Magic Hammer, in order to gain access to the large treasure chest in the center. You must do this quickly or you will drop down through the gap in the floor. If this happens, leave the room and return to reset the trap. Once you gain access to the chest, open it up to reveal the Titan's Mitt. Now that you have it, and the little girl is in tow, you can return to room 2A, climb upstairs to room 1L, and bring the girl to the room above 1E. When you lure the little girl that you rescued (who refuses to leave the dungeon) to the shaft of light in the center of the room above 1E, she will shriek in anguish and transform into her true form as the boss of the dungeon, Blind the Thief. This is a difficult fight as it's hard to dodge most of the attacks. Bringing fairies in bottles is a wise strategy. Blind moves left and right along the top and bottom of the room. His head is his weak point. He will either fire a laser at you, or shoot off small fireballs. When you hit him in the head enough times, he falls down while his head roams free of his body. His head will fly around the room independently and shoot fireballs at you, and there's little you can do about it. Meanwhile, a new head will grow in the old one's place, and the battle will resume. Strike the new head until that one is knocked off his body. One final head will take its place while you avoid the attacks of the previous two. Strike that head enough times until Blind is finally defeated, leaving a Heart Container behind. A good strategy is to stand behind Blind and use the Magic Hammer for three hits per head. 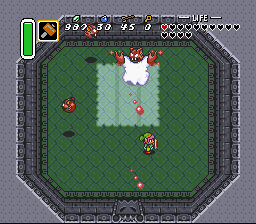 Collect the Heart Container and the fourth crystal will drop from the ceiling. This page was last edited on 4 August 2014, at 15:52.